E-cigarettes may not be the safer smoking alternative after all. E-cigarettes are under more scrutiny this week after researchers concluded the flavored products impair lung function in mice and one company was warned by the U.S. Food and Drug Administration for selling e-liquids that contain prescription drugs used to treat erectile dysfunction. The adverse health effects from the popular e-cigarettes, long touted by manufacturers as a safer alternative to traditional cigarettes, are not yet completely known. The devices and their refills are not regulated in the way that conventional cigarettes are. The FDA issued a warning letter Thursday to HelloCig Electronic Technology for violations of the federal Food, Drug, and Cosmetic Act after it found the company was selling the prescription drugs tadalafil and or sildenafil, which are used to treat erectile dysfunction, in e-liquid form. "There are no e-liquids that contain prescription drugs that have been proven safe or effective through this route of administration," said FDA Commissioner Scott Gottlieb. He said vaping active drug ingredients can be dangerous. The FDA actions come after the agency conducted a surprise inspection earlier this month of the San Francisco-based Juul manufacturer and seized documents related to their marking and sales practices. JUUL is a form of electronic cigarettes. Juul e-cigarette sales have increased 641 percent — from 2.2 million devices sold in 2016 to 16.2 million devices sold in 2017 — giving it the largest market share in the United States, the Centers for Disease Control and Prevention reported. In September, the FDA issued warning letters and fines to retailers caught selling e-cigarettes to anyone under age 18. It also gave the makers of e-cigarettes 60 days to show they can keep the devices out of the hands of minors. In 2017, more than two million middle and high school students reported using e-cigarettes, according to a National Youth Tobacco Survey. On Thursday, researchers from the University of Athens in Greece released the results of a mouse study, concluding that e-cigarettes may be just as dangerous as traditional cigarettes and that flavored products and other additives may exacerbate the detrimental effects of the vapors. Research conducted in mice often does not hold up when translated to humans, but the study results are important given the lack of research into the adverse effects of the products. The study, which will be published in the American Journal of Physiology — Lung Cellular and Molecular Physiology, was partially funded by grants from vendors of e-cigarettes. The results found that the damage on a cellular level was equal to or higher than that of cigarettes. 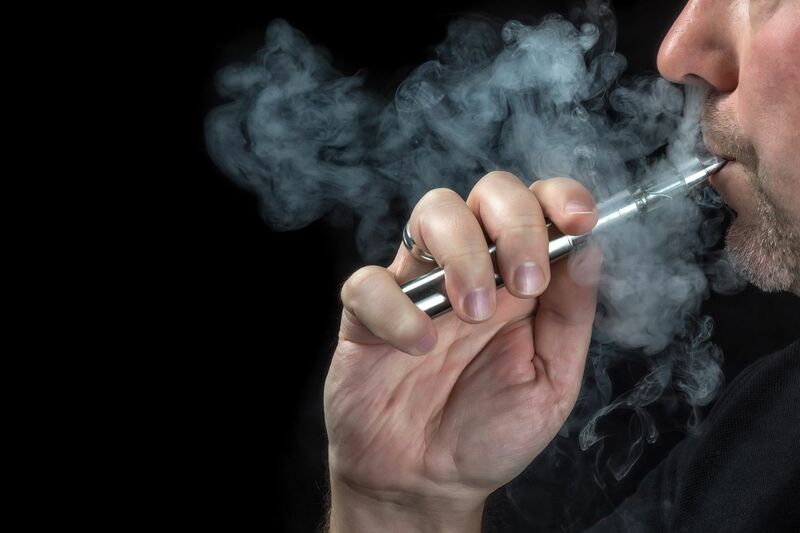 "Our findings suggest that exposure to e-cig vapor can trigger inflammatory responses and adversely affect respiratory system mechanics," the authors wrote. "We conclude that both e-cig vaping and conventional cigarette smoking negatively impact lung biology." The study looked at four groups of mice that received whole-body exposure to different chemical combinations four times a day. E-cigarettes give off a vapor that comes from liquid chemicals in refillable cartridges. The cartridges, which are often flavored, contain nicotine as well as propylene glycol, an additive found in processed foods and drinks. One group was exposed to cigarette smoke, one to e-cigarette vapor containing propylene glycol and vegetable glycerol; one to e-cigarette vapor containing propylene glycol and nicotine, and the last group, e-cigarette vapor containing propylene glycol, nicotine, and tobacco flavorings. After three days, the mice had increased inflammation, mucus production, and altered lung function in all three e-cigarette groups. The observed detrimental effects in mice "highlighted the need for further investigation of safety and toxicity of these rapidly expanding devices worldwide," the researchers wrote.